In this previous post, there was a suggestion that the Bloom’s Revised Taxonomy of Thinking Skills should be used when planning activities. Another way to think of Bloom’s taxonomy of thinking skills is the wheel designed by Dr. Doug Belshaw. This graph seems to downplay the hierarchy implied in the other graphs and suggest a balanced between higher-order and lower-order thinking skills. In other words, when planning pedagogical language activities, all these thinking skills should be taken into account. We reviewed several definitions and a bunch of task taxonomies in class. Later, at home I felt I needed to summarise what I think are the most important ones here. The first thing I did was to google the term task and I got Lee’s definition (2000: 32). This definition is consistent with Nunan’s when he states that a pedagogical task is a communicative act in its own right with a beginning, a middle and an end; it is a piece of classroom work that involves learners in comprehending, manipulating, producing or interacting in the target language while their attention is focussed on mobilising their grammatical knowledge in order to express meaning and in which the intention is to convey meaning rather than to manipulate form (Nunan, 2004: 4). Yet Bygate, Skehan and Swain (2001:11-12) put forward a broader definition. For them, a task is an activity which requires learners to use language, with emphasis on meaning, to attain an objective. Thus, the way tasks are defined depends on the purposes to which the tasks are used. That is, task will mean slightly different things to different stakeholders or groups of users (i.e. teachers, learners, examiners, researchers) and hence there is scope for misunderstanding between different groups. In an attempt to address the shortcoming in Bygate, Skehan and Swain’s definition and provide a generalised definition, Ellis (2003: 9-16) describes the six critical features of a task (in italics) and states that a task is a workplan that requires learners to process language pragmatically in order to achieve an outcome that can be evaluated in terms of whether the correct or appropriate propositional content that has been conveyed. To this end, it requires the learners to give primary attention to meaning and to make use of their own linguistic resources, although the design of the task may predispose them to choose particular forms. A task is intended to result in language use that bears a resemblance, direct or indirect, to the way language is used in the real world. Like other language activities, a task can engage productive or receptive, and oral or written skills, and also various cognitive processes. He goes on to describe two general types of tasks: unfocussed and focussed ones. The former may predispose learners to choose a range of linguistic forms but they are not designed to foster the use of a specific linguistic form, whereas the latter aims to induce learners to process, receptively or productively, some particular linguistic form (Ellis, 2003: 16-17). 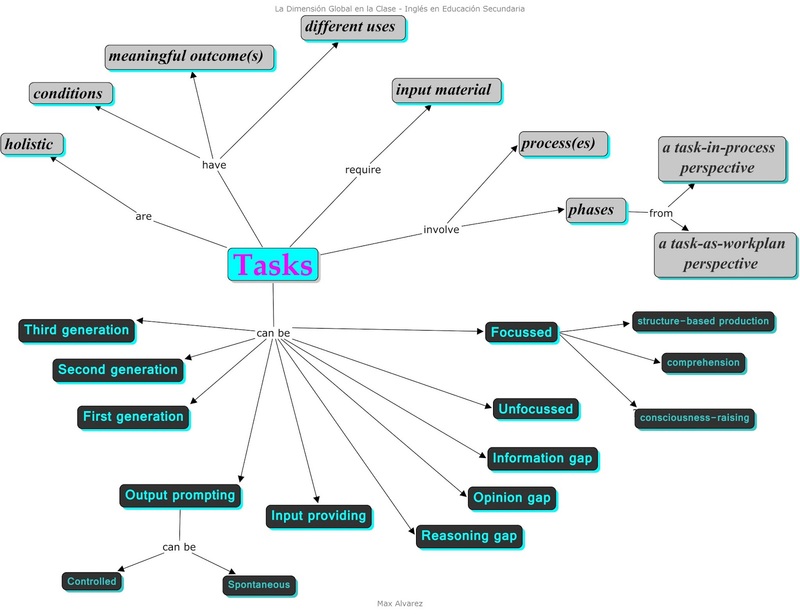 Focussed tasks can be designed as structured-based production tasks, comprehension tasks or consciousness-raising tasks (Ibid. : 151-167). Click on the links to find out more about these activities. Then, you can watch Dr. Rod Ellis' conference on Using Literature in Consciousness-raising Tasks. He also argues that tasks can be input-providing or output-prompting. Input-providing tasks engage learners in listening or reading, whereas output-prompting tasks engage learners in speaking or writing (Ellis, 2012: 200). Based on required vs. optional information exchange, Ellis then describes one of the earliest task taxonomies, which appeared in the Bangalore Project directed by N. S. Prabhu in 1979. Tasks can involve an information-gap activity, opinion-gap activity or reasoning-gap activity. The first one involves a required information exchange in which the information is split, whereas the second one involves an optional information exchange in which learners have to provide their own ideas about shared information (Ellis, 2003: 86). The third type involves a required information exchange in which the information to be conveyed is different from the one initially understood. This is so because it is derived through processes of inference, deduction, practical reasoning, or a perception of relationships or patterns (Nunan, 2004: 57). However, Ellis (2003: 102) points out that no research has examined interaction in relation to this type of task. Elaborating on Ellis’ definition (five paragraphs above), Samuda and Bygate (2008: 69-70) argue that a task is a holistic activity which engages language use in order to achieve some non-linguistic outcome while meeting a linguistic challenge, with the overall aim of promoting language learning, through process or product or both. Finally, Ribé and Vidal (1993: 2-3) distinguish three generations of tasks. First generation tasks focus mainly on the development of communicative abilities (e.g. problem-solving activities). Second generation tasks focus primarily on the development of the communicative competence and cognitive aspects of the learner (developing cognitive strategies that have to do with the handling, processing and organisation of information). Third generation tasks aim at developing the communicative competence, cognitive aspects and personality aspects in the learner through the attainment of wider educational objectives. They are thought to better address the issue of learners’ low motivation in state school systems. All in all, I think the most useful definitions are the one made by Samuda and Bygate (2008: 69-70) and that by Bygate, Skehan and Swain (2001:11-12). The former explicitly addresses the holistic nature of tasks and the linguistic challenge the learners have to meet, while the latter makes us aware of the important roles the task purpose and the stakeholders play in task design. Yet, since the term task seems to be quite biased in favour of certain approaches to second/foreign language teaching, I think I’ll keep using the hypernym activity – even though it may also be ambiguous and vague. By the way, when planning speaking activities, I’ve found it quite useful to consult this resource by Dr. Carl Blyth, Professor of French Linguistics in the Department of French and Italian and Director of the Texas Language Technology Center (TLTC), University of Texas. Bygate, M., P. Skehan and M. Swain. (2001). Researching Pedagogic Tasks. Second language learning, teaching and testing. Essex: Pearson Education Ltd.
Ellis, R. (2012). Language Teaching Research and Language Pedagogy. UK: Wiley - Blackwell. Lee, J. (2000). Tasks and Communicating in Language Classrooms. New York: McGraw-Hill. Nunan, D. (2004). Task-Based Language Teaching. A Comprehensively revised edition of Designing Tasks for the Communicative Classroom. Cambridge: Cambridge University Press. Ribé, R. and N. Vidal. (1993). Project Work. Step by Step. Scotland: Heinemann. Samuda, V. and M. Bygate. (2008). Tasks in Second Language Learning. Research and Practice in Applied Linguistics. Basingstoke: Palgrave Macmillan. Ana d'Almeida - For you always on a Wednesday! Max Miguel Velis Ayala, BA - . : el blog de Max :. @ the chalkface in a digital age by Max Alvarez is licensed under a Creative Commons Attribution-NonCommercial-ShareAlike 3.0 Unported License. Based on a work at http://chalkface-digital-age.blogspot.com.ar.